This body of research evolved around two multiyear projects. The first project, funded by the National Science Foundation, explored how U.S.-based multinational corporations, MNCs, manage the environmental and occupational hazards in their overseas facilities in developing countries. Our focus was on the value conflicts between health protection and economic development objectives; and on testing the then widely accepted theory of “pollution havens”, namely that the absence of national environmental regulations is the key factors in choosing the locations of MNCs’ subsidiaries in developing countries. Our detailed case studies in Thailand and India of subsidiaries of three companies – DuPont, Occidental Chemical and Xerox – contradicted the pollution haven theory. The second project, funded by the International Research and Exchange Board, IREX, and the National Council for Soviet and Eastern European Research, examined the transition of the occupational and environmental protection system in Poland during the post-cold war transition to democracy and market economy. In collaboration with David Angel at Clark University we demonstrated the importance of institutional and cultural continuity in fostering the success of Poland’s transition. 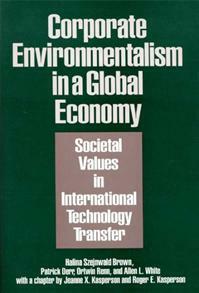 Corporate Environmentalism in a Global Economy; Societal Values in International Technology Transfer (with Derr, P.; Renn, O.; and White, A. L.) Quorum Books, 1993. Effective Environmental Regulation: Lessons from Poland’s Experience (with Angel, D.; and Derr, P.) Praeger 2000. Brown, H. S.; Angel, D.; Broszkiewicz, R.; Krzyskow, B. Occupational Health and Safety in Poland during the 1990s: Regulatory System Adapting to Societal Transformation. Policy Sciences. 2001, 34: 247-271. Brown, H. S.; Angel, D. Environmental Regulatory Reform in Poland: Lessons for Industri­alizing Economies. Environmental Science and Technology. 2000, 34:3849-3856. Angel, D.; Brown, H. S.; Broszkiewicz, R.; Wronski, S. The Environmental Regulation of Privatized Firms in Poland Environment and Planning C. 2000, 18:575-592. Brown, H. S.; Angel, D.; Derr, P. Environmental Reforms in Poland, Environment. 1998, January/February, 10. Brown, H.S. ; Cook, B.; Shatkin, J. A.; Krueger, J. R. Reassessing the History of Hazard­ous Waste Disposal Policy in the United States: Problem Definition, Expert Knowledge, and Agenda-Setting. Risk. Issues and Health, Safety and Environment. 1997, 8, 249-272. Himmelberger, J.; Brown, H. S. Global Corporate Environmentalism: Theoretical Expecta­tions and Empirical Experience, Business Strategy and the Environment 1995, 4, 192-199. Brown, H. S.; Himmelberger, J. J.; White, A. L. Development-Environment Interactions in the Export of Hazardous Technologies: A Comparative Study of Three Multinational Affili­ates in Developing Countries, Technological Forecasting and Social Change 1993, 43, 125-155. Renn, O.; Brown, H. S.; White, A. Ethics and Value Issues in Managing Hazardous Tech­nologies by Multinational Corporations in Developing Countries., Environmental Science and Technology 1991, 25, 1964-1969. Brown, H.S. “Can Poland’s Success in Environmental Policy Reforms Translate to Technological Innovation for Environment?” In: Weber, M. and Hemmelskamp, J., eds., Towards Environmental Innovation Systems. Heidelberg: Springer, 2005, pp. 81-96. Broszkiewicz, R., Brown, H.S. and Hibner, Z. Occupational and Environmental Status of Polish Industry: A Comparative Study of Private and Public Sectors. New Solutions. 2002, 12(3): 263-280. Rossi, M.; Brown, H. S.; Baas, L. Leaders and Partners in Sustainability: Defining the Agenda and the Agents of Change. Business Strategy and Environment. 2000, 9: 273-286. Broszkiewicz, R.; Krzyskow, B.; Brown, H. S. Occupational Safety and Health System in Poland During Transition to Democracy and Market Economy, New Solutions. 1998, 8 (2), 221-242. Brown, H. S. Two Decades of Environmental Legislation in the United States: Its Relation to Societal Values. Proceedings of a Workshop on Environmental Health and Safety in Poland: Confronting the Transition to Democracy and Free Market Economy. Central Institute of Labour Protection in Warsaw, Poland, May 1996. Brown, H. S. Lessons from Bhopal, Chemical and Engineering News 1994 (October), 38-39. White, A. L.; Brown, H. S.; Himmelberger, J. J. Corporate Environmentalism in Developing Countries: A Tale of Three Multinationals, International Environmental Affairs 1992, 4 (4), 338-360.